Temperatures in glaciers and ice sheets vary in space and time. Temperate glaciers have temperatures at or close to 0°C, while the upper part of the Antarctic ice sheet may be as cold as -40 to -60°C (Fig. 4.2). The melting temperature of ice decreases with increasing pressure at a rate of 0.072°C per 106 pascals (MPa; lPa = INm-2). As an example, the pressure at the base of a 2000 m thick glacier or ice sheet is about 17.6 MPa, corresponding to a lowering of the melting point to —1.27°C. Therefore in glaciers and ice sheets it is more appropriate to use pressure melting point rather than melting point. The melting point is also influenced by solutes. The freezing point of-normal seawater is approximately -2°C at atmospheric pressure. The temperature distribution in glaciers and ice sheets is important because it is related to other glaciological and geological processes. The rate of deformation is dependent on temperature. A cooling from -10 to -25°C reduces the deformation rate by a factor c five. Basal ice temperature controls erosion. Glaciers and ice sheets at the pressure melting point are able to erode, but if the bed is frozen to the substratum, glacial erosion may be negligible. If the basal temperature in a frozen glacier or ice sheet suddenly reaches the pressure melting point, it may start to slide and cause a glacial advance. The temperature of glacier ice is controlled by three main factors: (a) heat exchange with the atmosphere; (b) the geothermal heat flux; and (c) factional heat due to ice flow. The surface ice temperature is controlled by the air temperature. Geothermal heat and, if the glacier is sliding, frictional heat influence the basal ice temperature. Internal deformation and refreezing of meltwater are important factors for the englacial temperature distribution. In addition, conduction, glacier movement and water flow/percolation all transfer heat within the ice mass. (a) The entire ice mass is below the melting point. (b) The ice mass is at the melting point only at the sole. (c) A basal layer is at melting point while the upper part is below the melting point. (d) Except for a ca. 15 m surface layer subject to seasonal temperature variations, the ice mass is at the melting point. Glaciers in category (a) and (b) are termed polar or cold, while category (c) and (d) glaciers are called polythermal and temperate, respectively. Values of thermal parameters for pure ice are listed in Table 4.2.
subsequent year's snowfall will remain at the same temperature and equal to the mean annual temperature at the surface of the ice mass. This is, however, only the case if the maximum air temperature is less than 0°C. Meltwater that refreezes makes the temperature in the firn higher than the mean annual air temperature. The temperature on the glacier surface does not rise above 0°C if the air temperature does. Winter snow reduces heat loss, causing the ice temperature in the ablation zone to be higher than outside the layer of snow from the last winter season. 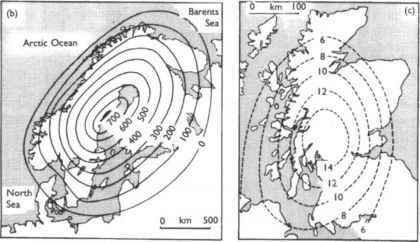 Figure 4.2 shows a regression analysis of annual air temperature and 10 m depth firn temperatures in the dry-snow zone in Greenland and Antarctica (Paterson, 1994). Since air temperatures commonly decrease with increasing elevation and increasing latitude, so do glacier temperatures. Several factors influence the temperature regime in glaciers, such as the heat that is produced by transformation of mechanical energy within or beneath a glacier. The most important factor, however, is the heat exchange in connection with conduction, radiation and convection. Meltwater transports heat energy to the inner and deeper parts of temperate and subpolar glaciers, causing energy release when this water freezes. The temperature conditions and distribution in ice sheets are mainly determined by the air temperature in the accumulation zone, the amount of precipitation, glacier dynamics and the geothermal heat flux. Since both temperature and precipitation in addition to glacier dynamics vary significantly between the margins and the central areas, the isotherms (lines through areas with the same temperature) are not parallel with the glacier surface over large areas. The geothermal heat flux and the frictional heat in the glacier sole may have a significant impact on the glacier movement, since the plasticity is related to temperature. Surging of polar and subpolar glaciers may be explained by these effects. The heat flux from the interior of the Earth is about 50 calories/year/cm2. 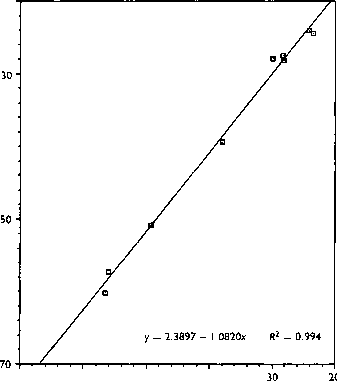 This corresponds to melting of an ice thickness of about 7mmyr 1. In volcanic areas with large geothermal heat fluxes, the heat flow may be a significant factor in subglacial melting. At the initiation of the melting season, the meltwater in the accumulation area starts to penetrate into the snow, releasing latent heat by freezing. The temperature in the permeable snow pack may therefore ultimately reach 0°C. In temperate glaciers the winter cold may reach down to 5-10 m depth. During the autumn and winter cooling, the water-soaked snow freezes first. This causes a slow downward freezing of the snowpack, and deeper parts of the firn area may therefore remain at the melting point throughout the winter season. In the ablation area, the situation is different because impermeable ice ensures that the water, except in crevasses and holes, flows off on to the glacier surface. The temperature is therefore mainly determined by conduction. Because the temperature on the glacier surface does not rise above 0°C, the temperature down in the ice, where annual temperature variations are not detected, is determined by the mean temperature below 0°C on the glacier surface. On temperate glaciers, therefore, ice temperature may be lower in the ablation area than in the accumulation zone. 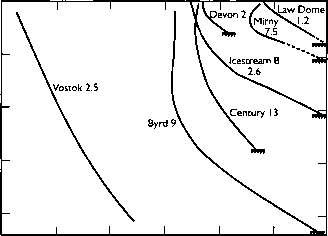 Figure 4.3 shows measured temperature profiles in glaciers (for references, see Paterson, 1994:221). Most curves show the features of the theoretical curves based on heat advection. The negative temperature gradients in the upper parts of the Byrd Station and Mirny sites are due to flow of cold ice from greater altitudes. The mean temperature gradient for all the profiles is 1.8°C per 100 m. Temperature gradients at the bed range from 1.8°C per 100 m at Camp Century to 5.2°C per 100 m at Mirny. A geothermal heat flux of 50mWm~2 gives a temperature gradient of 2.4°C per 100 m in the ice (Paterson, 1994). Since ice sheets never reach steady-state, the temperature distributions will not be in accordance with modelling based on this assumption. Non-steady-state calculations need information concerning, for example, past surface temperature, accumulation rate and ice thickness. Ice cores can now provide pertinent information about these parameters. Investigations have shown that temperature variations during a glacial cycle could penetrate an ice sheet by means of conduction (Paterson, 1994). As a result, the basal temperature gradient changes with time. Almost all calculations of time-dependent temperatures have been based on the assumption that velocity adjusts to changes in precipitation, and therefore the ice thickness is constant, an assumption which is not true. A doubling of the precipitation rate over the Greenland ice sheet may increase the thickness of the ice by 10-15 per cent over a few thousand years.